Foreword by Gregory Maguire, New York Times bestselling author of Wicked. When L. Frank Baum introduced Dorothy and friends to the American public in 1900, The Wonderful Wizard of Oz became an instant, bestselling hit. Today the whimsical tale remains a cultural phenomenon that continues to spawn wildly popular books, movies, and musicals. Now, editors John Joseph Adams and Douglas Cohen have brought together leading fantasy writers such as Orson Scott Card and Seanan McGuire to create the ultimate anthology for Oz fans — and, really, any reader with an appetite for richly imagined worlds. In Blown Away, Jane Yolen asks: What if Toto was dead and stuffed, Ozma was a circus freak, and everything you thought you knew as Oz was really right here in Kansas? A Note On Suggested Reading Age: L. Frank Baum’s original Oz books were works of children's fiction — albeit ones that have been known and loved by 'children of all ages' throughout their existence. 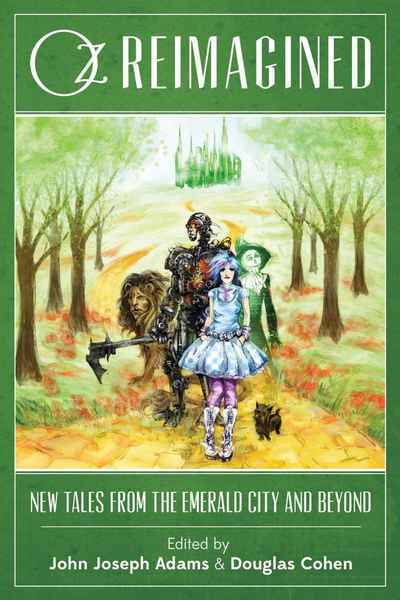 Though many of the stories contained in this anthology are also suitable for the aforementioned children of all ages, Oz Reimagined is intended for ages 13 and up, and as such, some of the stories deal with mature themes, so parental guidance is suggested.